New methods and technologies for energy storage are required for the transition to renewable energy sources. 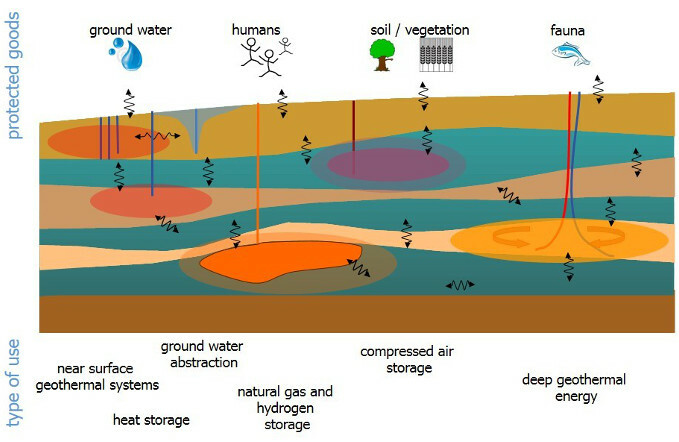 Subsurface energy storage systems, such as salt caverns for hydrogen, compressed air and methane storage or porous formations for heat and gas storage offer the possibility of hosting large amounts of energy or substance. When employing systems, an adequate system and process understanding is required in order to predict the complex and interacting effects on protected compartments as e.g. shallow ground water. This understanding is the basis for assessing the potential as well as risk connected with a sustainable usage of these storage options, especially when considering possible mutual influences. The ANGUS+ project therefore aims at developing and applying an open source numerical simulator for the induced coupled thermal, hydraulic, geomechanical and geochemical processes. Realistic - however synthetic - scenarios for the use of the geological underground as an energy storage system are then developed, parameterized, numerically simulated and interpreted with regard to risk analysis and effect forecasting. Using the simulated and interpreted scenarios, monitoring concepts are derived, tested and validated, and a first methodology for large scale planning of the geological subsurface considering different surface and subsurface usage scenarios is devised. This study is funded by the German Federal Ministry of Education and Research (BMBF) within the framework of the “Energy Storage” research program.